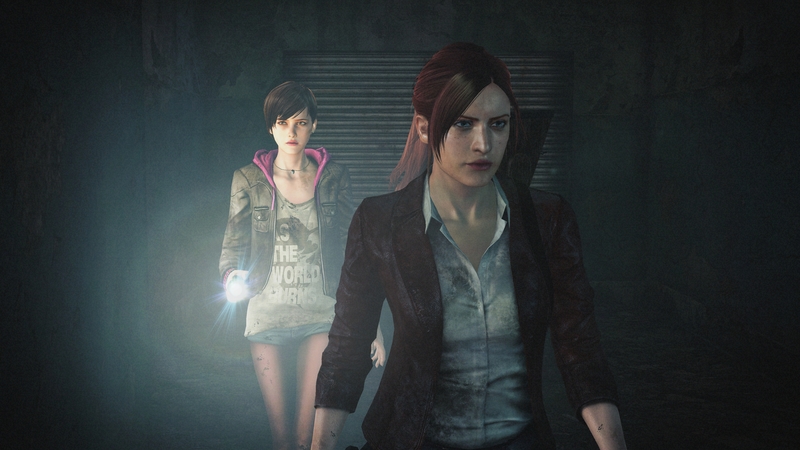 Resident Evil: Revelations 2 takes a step in the right direction following Resident Evil 6, but is it enough? Resident Evil 6 was pretty terrible. 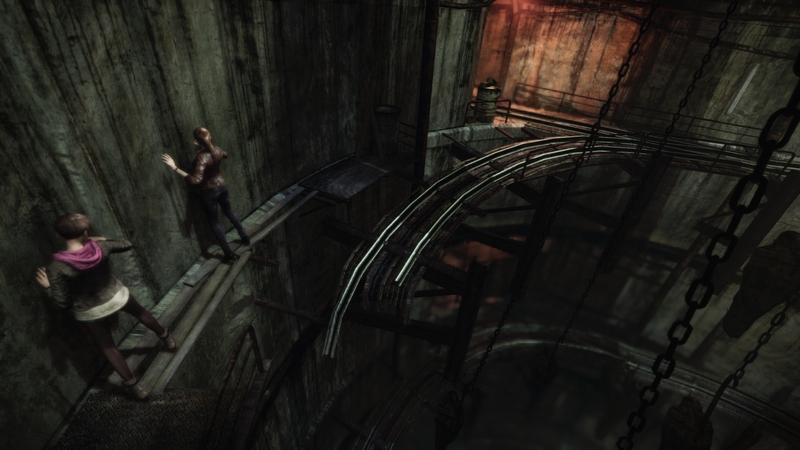 The series had been slowly moving away from survival horror since Resident Evil 3, and by the time 6 rolled around, it had essentially turned into a cover shooter. Resident Evil: Revelations, which started life as a 3DS exclusive tried to bring the series back to its survival horror roots, and managed to do surprisingly well. It eventually led to Capcom porting it to consoles. 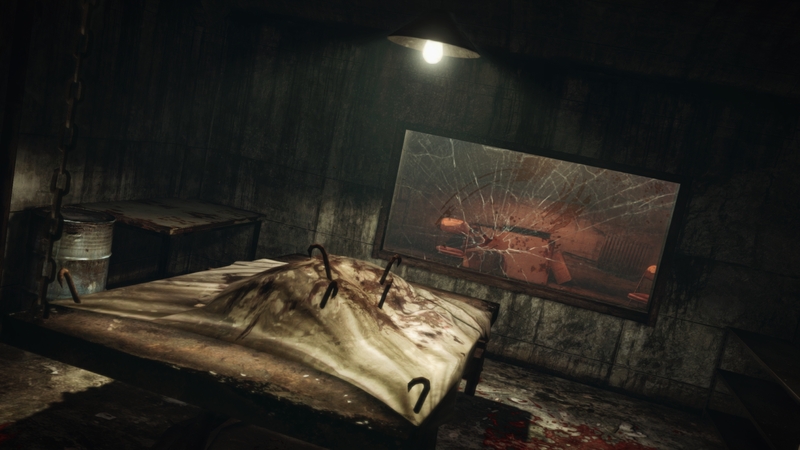 Fans praised the game's decision to make the series actually frightening again, and it looks like the sequel will continue that trend. 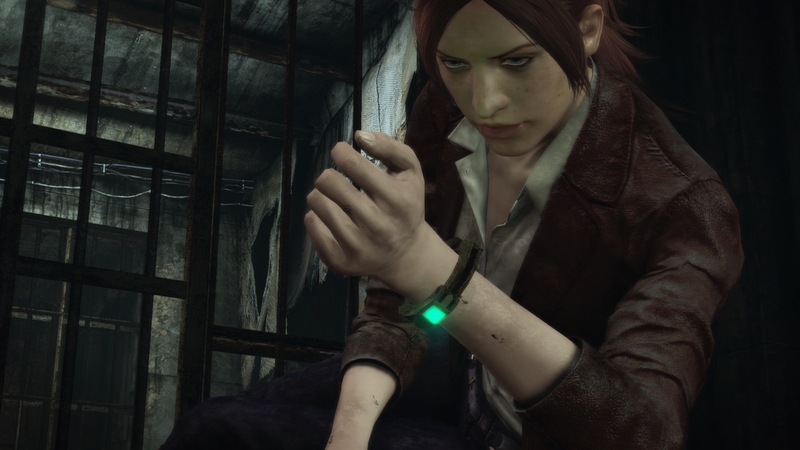 At this year's Tokyo Game Show, I got to try out an Xbox One build of Resident Evil: Revelations 2. This time around, it's skipping the 3DS right from the get-go, and coming to every home console except the Wii U. The demo was nice and long, and let me get a pretty good feel of what to expect from the game, and I can assuredly say it is a step in the right direction after Resident Evil 6. But is that enough? In the demo, I took control of Claire Redfield, the heroine of Resident Evil 2, and teamed up with new character Moira Burton, the daughter of Resident Evil veteran Barry Burton. Just like in Resident Evil 5, the two-player mechanic looks like it will be integral to the game, and it appears that the entire game will be playable in co-op. Claire wakes up in your bog-standard "creepy run-down prison" and has to fight her way through all the creatures that go bump in the night to discover a way home. 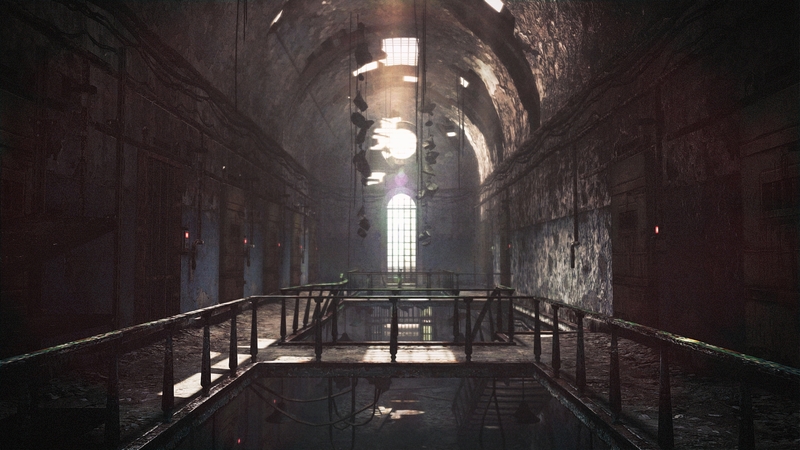 Despite being a setting we have seen dozens of time before, Revelations 2 does a fantastic job of building atmosphere. There were quite a few times when I was genuinely frightened, as the game did a fantastic job of using the darkness to keep you on your toes. In fact, Moira's main role is to be on "flashlight duty", shining her torch around to discover hidden items and light the way. When the zombies did eventually pop out, at first, I wasn't too phased. By themselves, they are quite easy to dispatch, with a shot to the head, and a strong melee follow-up. However, the game wasn't going to let me go so easily, and it wouldn't be long before it started throwing multiple baddies at me. It worked really well, and it made the decision to fight-or-flight a much more weighty one. Ammo seems to be a bit harder to come by, and your melee weapon isn't the unstoppable killing machine it was in prior games, so when you choose to fight, it's actually quite tough. Bringing back the ammo urgency is probably the most welcome move in the game, as Resident Evil kind of stops being scary if you know you can just mow down everyone and everything you come across. I'm really interested to see how Moria will work in co-op. In singleplayer, you can switch to her with the press of a button, and while she refuses to use guns, she can blind enemies with her flashlight, and then wallop them with a crowbar. I wonder if it will be enough to keep player two interested, or if they will eventually allow her to use guns. 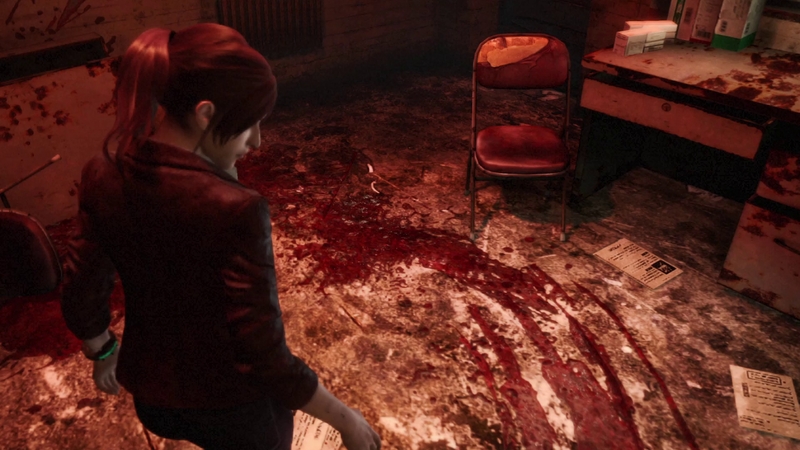 Unfortunately, Revelations 2 is not a very pretty game. It may have something to do with it being developed in tandem for next-gen and last-gen consoles, but I really couldn't see it taking advantage of the Xbox One's hardware. To put it bluntly, it still looked like an Xbox 360 title. Despite this, I still really enjoyed the demo. It was fun and scary at the same time, and if the full game can keep up the pace, It will definitely be enough to get me interested in Resident Evil again. 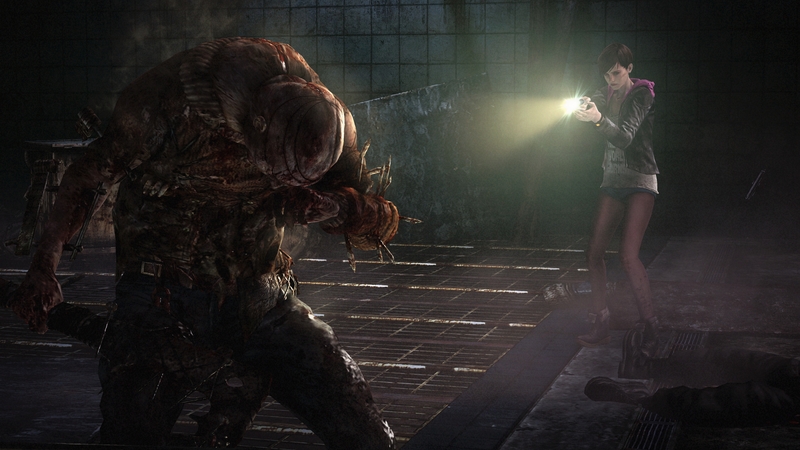 Resident Evil: Revelations 2 is due out in 2015, and will be released in an episodic format. It's interesting to see them finally address some of the key issues with the franchise, namely bringing back the "horror" aspect of survival horror. I haven't really been impressed with the franchise since Resident Evil 4, and as much as I loved the fourth installment, having your character be a walking gun shop made all the scary disappear. You're not too worried when you're totting two different handguns, a shotgun, a sub machine gun, a rifle, more grenades than pockets in a pair of cargo pants and so much ammo that head shots aren't necessary. The game was more of - shoot the zombie for currency so I can buy upgrades than deciding if firing was even necessary. Ammo wasn't ever rare. I miss the days of deciding if running or using my precious ammo to kill a zombie, or if I should use my healing herb now, or save it. Hopefully that's where they take it, but I'll remain cautiously optimistic until I see reviews of the final product. I really want to get excited for this, but right now i'm waiting to see whether or not Capcom can actually pull themselves out of the runt they got themselves into with RE6. Still, the idea of Claire coming back and the new mechanics (and the return of an old one) does sound interesting. Claire waking up in prison is how all good things start. Was that a Makarov at 1:07? Is the prison in Eastern Europe? looks good and actually creepy. if true with the ammo, then this could be a spooky title. like the idea of switching between characters and that one is not fond of holding guns. which is kind of weird since barry was clearly a gun nut. never the less, the idea is good and i hope it forces you to be careful what you do and shoot. I don't understand when people say Resident Evil: Revelations was a throw back to the classic survival horror games of old. I played it for 2 hours and couldn't stand it. It is basically RE4 with no consistent inventory or straight forward story progression. personally i think the game is awful and doesn't provide a single element of survival or horror outside oh so scary monsters popping out from the corners. RE is dead to me and I'm fine with that because there are plenty of other better indie horror games out there. Capcom has no intention of innovating with horror or RE; it's pointless to keep giving this series any press at all. I recently picked up RE6 just to see how bad it really is and the only positive thing I have to say about the game was that it had an interesting idea with the four intersecting story lines. As much as I would like to say that one of the biggest problems with RE6 was that it wasn't a scary game or that it wasn't faithful to its roots, it was a bad game all and all. Poor AI, a horrible inventory system, bad UI, cover mechanics that were a hinderance, way too much QTE, forced events that don't make sense (such as walking through a metal detector while hanging onto two weapons), and many others. It has become the only game I have dropped to the easiest difficulty just to work my way through the entire game to see if it gets any better. So as much as those elements you are talking about sound interesting, if the systems behind those elements are as bad as Resident Evil 6, this game isn't going to improve the franchise at all. I like they brought at least one new character in, but it would be nice to have two new ones instead and maybe make both not know much about guns. Maybe make it so that the character is learning how to use guns out of necessity on the spot so it takes time to reload. the story of the 4 chapters was indeed a good thing of the game. plus the characters were all playable which was another good thing. also that each of them crossed each other paths was nice. i mean, where did you see leon and chris together? but yes, the QTEs were too much. thats why i played it on easy just to avoid them. this made the game actually more enjoyable. 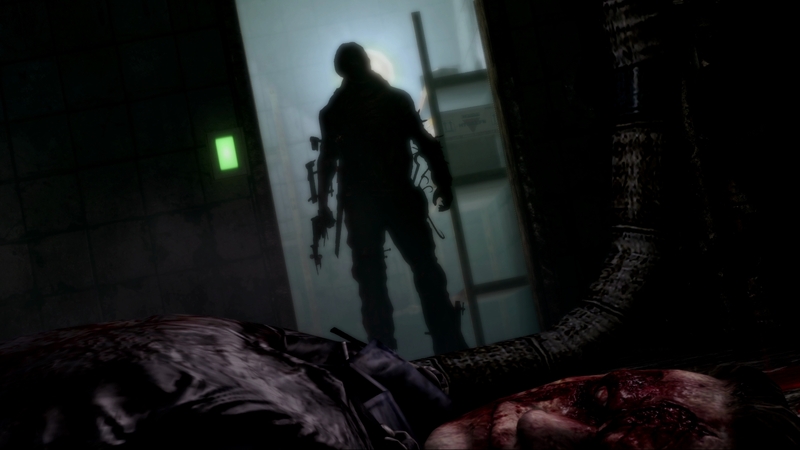 of course as a horror game, RE6 fails miserably. as a action game, it did actually pretty well and i actually enjoyed it. from an action perspective i mean. I think for me it will be high hopes low expectations for this one. Ironically I think part of the issue with the horror aspect is the fact they keep bringing back the veteran characters, when we really need to have a protagonist that is NOT in the know about what is going on. Claire was good up through Code Veronica and Leon was good in Resident Evil 4, but man those older characters like Chris, Jill, and company are just like "Oh more BOWs from Umbrella!" I like the new art for Claire. She's recognizable, but she looks like she's just tired of zombie-infested hellscapes. She looks burned out, which makes a lot of sense, really. never really looked at her like that. rather more dirt due the prison and being very puzzled whats going on. i wonder if they make any references to the movie. I'm sure they will. From what I read, she gets to the prison after being attacked at a TerraSave party, which is the company she was involved with in the movie. So there will probably be plenty of references to that. Anywho, I'm really looking forward to this :D I love Claire, and I was worried we wouldn't get another game with her after Capcom said she was taking a pacifist role from now on. The gameplay that I saw looks excellent so far, so I've got high hopes for this one. lets hope not from the live action movie. the CGI was at least more or less true to the game and actually enjoyable. since you say pacifist way, i guess clair didnt want to shoot first but was forced to do so.